It feels like all the gardening jobs have hit me at once this week. Not only do I have my own garden to care for, but I also designed and manage my parents garden, so it's been all systems go with many more seeds to sow, new plants to find space for, ponds to clear and patios to jetwash. One thing I've really been trying to do this year is buy more UK grown plants. It's surprising just how many are grown overseas and exported here, which is really sad, as our economy needs the money as do our nurseries and garden centres. 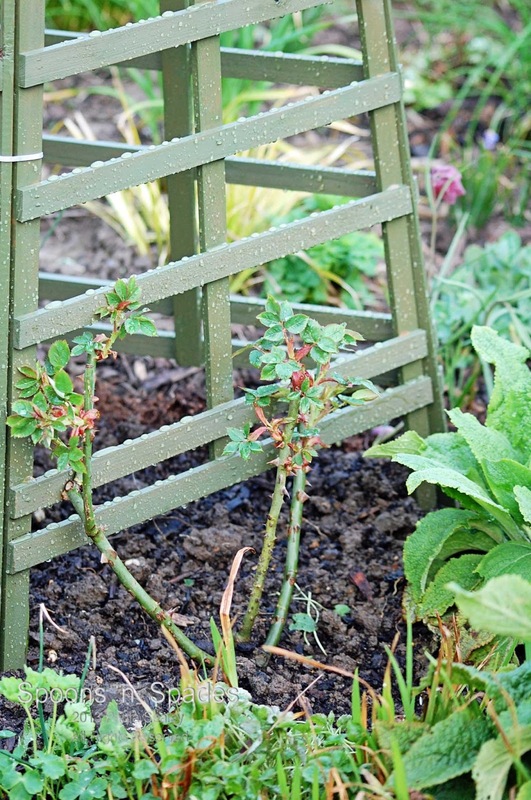 It's also said to be more beneficial to the gardener to have locally raised plants, as they will be more tolerant of our conditions here in the UK. There was a small but pleasing UK grown selection at my favourite garden centre. 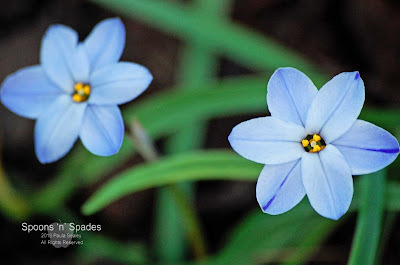 I bought some of these beautiful Ipheion (Rolf Fiedler) to go around one of my wildlife ponds. 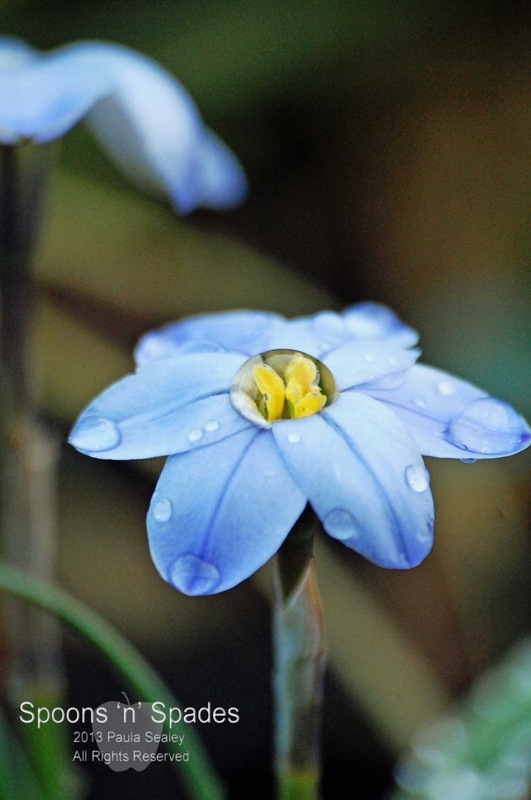 They have the daintiest blue flowers and look amazing, especially after an April shower. This pretty lamium was also UK grown. It has shell pink flowers with variegated leaves and should look great once it starts to spread and mingle. I also picked up some more Narcissus, just because you can never have enough, and happily, they were locally grown. During the same trip, I managed to find just the right plants to go up my new obelisks. I've chosen a beautiful climbing rose called Joseph's Coat for one and another called Summertime for the second. I also couldn't resist another Clematis. This one is Rosea, which I understand can support itself as it tends to have a bushy habit, but I've still planted it near an obelisk as it should flower at a different time from the rose and give more interest. 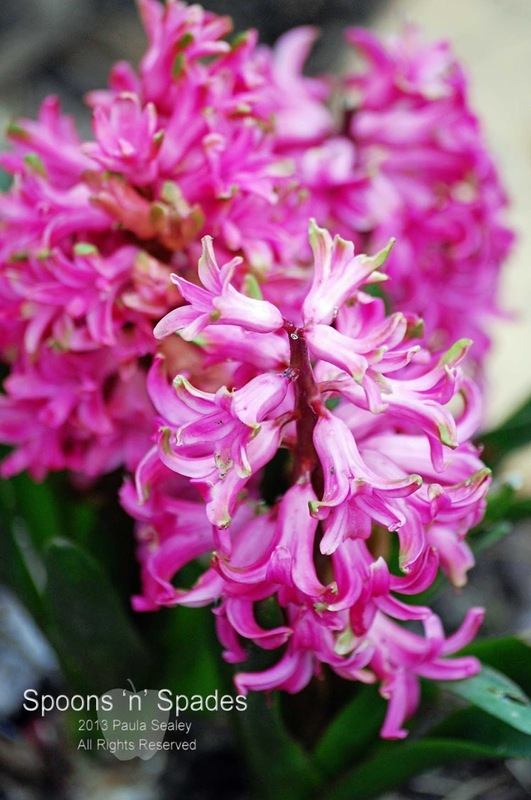 The perfume from the hyacinths is completely intoxicating in the garden now. I have so many in little clumps their scent follows you all over the garden. The Himalayan Cowslips are in full bloom around the ponds along with the Snakeshead Fritillary. And the ponds are my next job to tackle. Busy, busy, busy! I like the Ipheion - it's amazing how many of us have taken photos of flowers sporting raindrops this year. OK then given conditions - not very amazing. Isn't that the truth Sue. And I say this while watching the rain stream down the windows...again! I love that little blue flower - one I've never heard of. We are having our pond professionally cleaned out this weekend, there is so much silt at the bottom. It would have cost just as much to hire the equipment we needed to do it. Your flowers are a bit further along than mine but the garden is gradually starting to colour up. Oh, I envy you getting yours professionally cleaned Elaine, although ours is only small so manageable. I do get fed up with doing it though. My Snakeshead Fritillaries are only just beginning to pop up through the soil, we must be further behind than you. I've planted a couple of climbing roses which I was given for Mother's Day, I'm looking forward to seeing them bloom. What a lovely Mother's Day present Jo. It's always nice to have a permanent reminder of a special occasion in the garden. It's a nightmare when everything needs doing at once isn't it.....and I completely sympathize with the achy back syndrome!!!! Having two gardens will keep you busy....I just about cope with one. I do agree re buying UK plants, so many non-native plants can become invasive and kill off native plants. This is a busy time of year, and sounds like you have a lot of garden(s) to tend to! 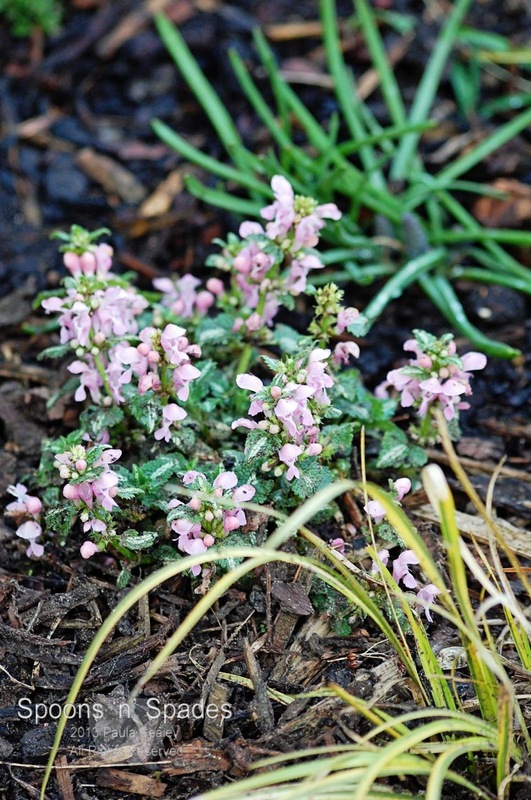 I'm glad you posted the picture of your lamium in bloom. 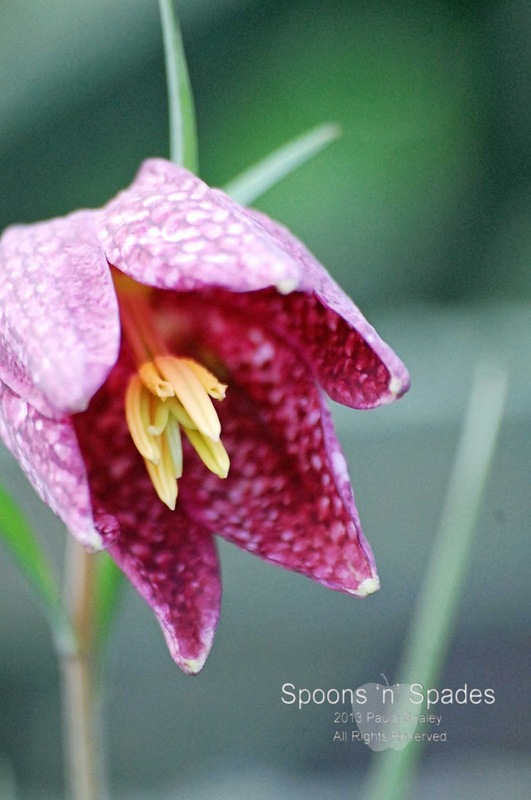 I just purchased some of these, and look forward to mine blooming. 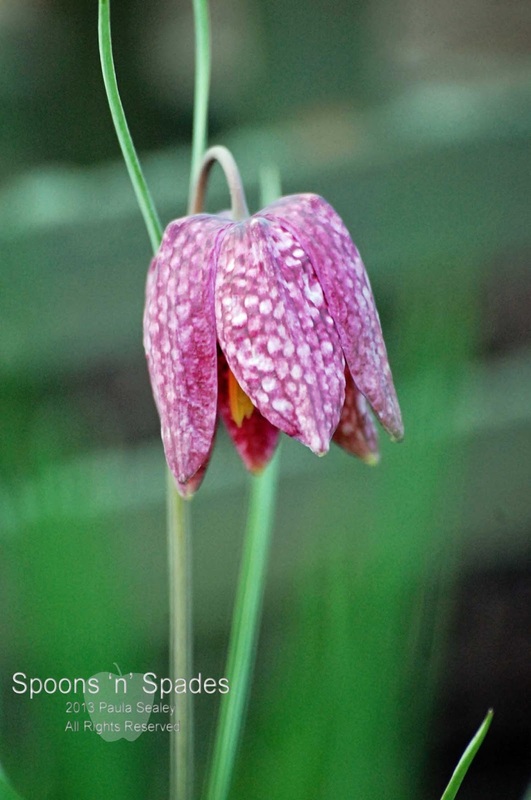 I also love those little fritillary. Such interesting blooms. Smart of you to look for locally grown plants. I think it really should make a difference in their success. Your lamium is miles ahead of mine - only just showing signs of growth up here. I have Beacon Silver and White Nancy - very good for the pollinators! It's pretty isn't it Angie. I've never come across it before, but I know I'd like some more if I spot them again. I look forward to seeing your varieties of lamium in bloom. Sounds like you've been very busy but all the hard work this time of year pays off. Its such a busy time of hear for gardening - my back has suffered too. Mine is aching today after another days work outside. Hopefully, I'll be able to put my feet up and rest on Sunday! Yep its a busy time I certainly agree, it seems like everyone is posting pictures of lovely blue flowers. I love it. You are so right to buy British and support smaller growers too. Yes, I've seen some lovely posts featuring blue flowering plants too Annie. 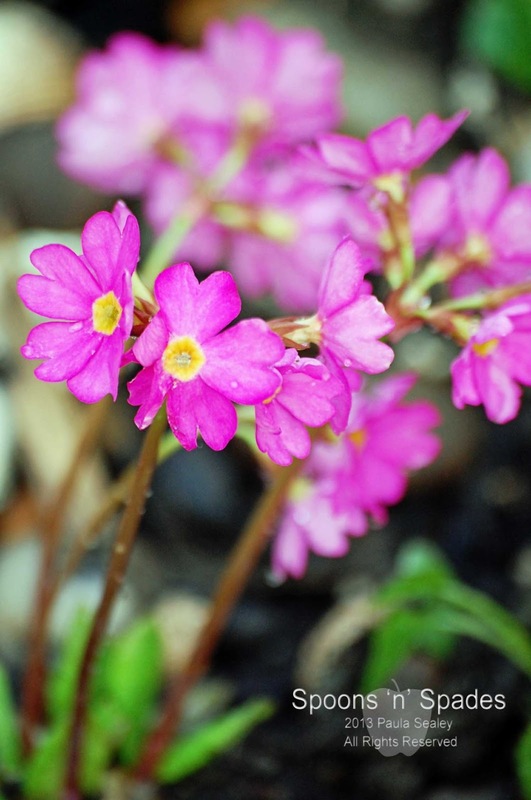 Your spring flowers are lovely, I love the pinks and blues. It is wonderful to be out gardening in some warm sun at last, but it is also hard work! (I'm going to be spending a lot more time looking after my parents' garden this summer, too) And I completely agree about buying British. It's much easier to shop British for food now isn't it Anna. Hopefully, plants and flowers will catch up soon. Lovely spring flowers and beautiful photography! My hyacinths are flowering too now, but I have only one big area with them, perhaps I should get some more and plant them all over the garden like you have. But it might be too shady for them though, more than half of my garden is shady or semi-shady. I like lamium too, I have 'Hermann's Pride' and 'Beacon Silver'. Hope you'll get a lovely garden week-end, take care, Helene. I have some hyacinths in shady spots Helene and they seem to be doing okay. In fact, I found three completely hidden underneath a hebe yesterday and they were still blooming. I'll have to look out for the other varieties of lamium, it would be nice to have a mixture.